In spite of all the complaints you hear out there, Amazon’s KDP select may still be worth it. And as the title suggests, that’s for one reason – advertising. I’ve played with ads for my books on Goodreads and Facebook, but the success has been unimpressive. Amazon, however, makes sense. Only KDP books can be part of it, so you know right there who your competition is. It’s been about two weeks now since I signed with my first fiction book publishing contract, and now I am preparing to possibly sign with a publisher for one of my non-fiction books. It is an exciting time, and I want to bring up some considerations for others at this crossroads. When self-publishing, you take on a lot of the risk, but you also have freedom. You can do price promotions when you want, decide on your cover and all that jazz, but you have to be serious about the details. Plus, you can publish immediately! Small presses take anywhere from 3 months to 3 years to get your book out there. When working with a publisher, there is a risk that they may do something you don’t like, but it’s also more likely that they have a better idea of what they are doing than you would if you were to do it yourself. Having someone out there with a known name marketing your book will likely lead to enough sales to make up the difference in royalties you’ll be losing to your publisher. However, I have heard a lot of stories of small-press publishers NOT doing any real marketing – so make sure to know what you are getting into. There’s a chance that, when publishing with a traditional publisher, someone may discover your book by clicking on another book by your publisher and going to their website. Just because you go with one publisher, it doesn’t mean you always have to go that route. But beware that a lot of contracts will have stipulations, such as the right to consider your next book. Some authors prefer to be self-published, others traditionally published. Some, as is the case with me, like the idea of being a “Hybrid Author,” both traditionally- and self-published. It’s like splitting in Blackjack (is it? I actually don’t understand the game that well, but you get the point). Some of us may not like to admit it, but traditional publishing still carries a certain level of prestige that self-publishing may not. Yes, most people just see your book on Amazon (Nook, etc.) and think it’s awesome you published a book, but if you meet someone at a writers conference or agent pitch fest or whatnot and they ask if you are self-published, you may see interest drop when you say yes. That used to be me (sorry!). My co-blogger here shared stories with me as well, where she met folks who said skeptically “Oh, you’re published?” and only showed real interest when they learned she wasn’t self-published. Unfortunately, a lot of people self-publish works full of issues, so you can’t totally blame the skeptics. So if it’s the prestige you are after, considering going traditional with at least one of your books. 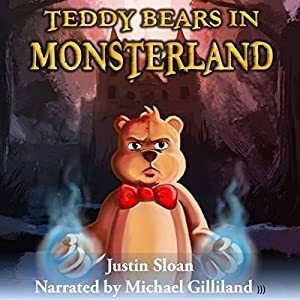 If you would like to follow my book publishing progress, you can find several of my self-published novels on Amazon, to include Teddy Bears in Monsterland and Back by Sunrise. My literary novel Mohira will be published when the publisher is ready! Why would you just sell your book in ebook or print, when you could sell it as an audiobook? Maybe your answer is that you have no idea how to get your book into audiobook format. If that’s the case, there are a couple of choices, but the one I like is ACX.com. Is Amazon the New Blog Platform? Are you blogging or are you writing a book? Why not both! This year marked another year at the San Francisco Writers Conference, and I had a great time. One topic that was raised in a conversation with some attendees was the idea of Amazon.com as a place to blog. What’s that, you ask? Amazon is a place for books! This is what I mean – I don’t mean posts blogs, but take your blog ideas, and expand them into books. Yes, but many of those books are Level 50 blogs (video game reference), as you will see especially in the $0.99 books. When we think of post-military careers, “creative writing” isn’t always the first thing to come to mind. But that’s what writing is for our own Justin Sloan. He was recently interviewed for a One Bold Move podcast (link below) that focused on his transition out of the military and into a life of creative writing. But for Justin, it’s not so much about choosing creative writing. It’s about (1) How to discover your passion, and (2) How to follow your passion. As a Christmas present to all of you, I would like to share my interview with Will Wight, the author of the Travelers Gate trilogy. It makes sense for me to share this with you all today, because Will is offering a Christmas discount on the second book in his trilogy, The Crimson Vault. He also has his next series coming out soon, and the cover looks amazing (Of Shadow and Sea). To add extra candy to the stockings, my book Creative Writing Career features his interview and many more, and is also on a Christmas sale for $0.99. So treat yourself to some Christmas magic and pick up electronic copies of both of our books and enjoy some wonderful reading this weekend. Will went straight into an MFA program from undergrad, published the first book of his trilogy, and has had some success working as an author. The result of his drive to write was that he did not have to find a mediocre desk job like many of us have to do in order to pay the bills—he is a writer who pays his bills through his writing. We have much to learn from Will. Have you considered turning your novel into a screenplay? How about a graphic novel? Video Game? Many writers out there find that dipping their toes in multiple lakes leads to a greater chance of success, and if nothing else it will lead to more discoverability. Take for example, the first question I ask of Allen Warner (below), in my interview with him that you can find in my book, Creative Writing Career. Allen’s journey included a screenplay, a short story, and the published graphic novel series. And the screenplay was optioned! This likely would not have been possible if he just sat back and wrote the novel version. Today I am happy to share my interview with Tomiko Breland, who I had the pleasure of meeting at my time in the Johns Hopkins MA in writing program. Tomiko is a fiction writer and an Associate Publisher at The Zharmae Publishing Press. She won the Ploughshares Emerging Writer’s Contest and is working on a novel. Additionally, she has an editing/graphic design/freelance business, called Paper Star Editorial & Design. This week I had the great pleasure of being introduced to Jerri Bell, who was kind enough to share some thoughts with us on the process of editing and how she got to this point. Jerri Bell served in the Navy from 1988-2008. Her fiction has been published in Stone Canoe; her nonfiction has been published in The Little Patuxent Review and the Charleston Gazette-Mail, and on the Quivering Pen and Maryland Humanities Council blogs; and both her fiction and nonfiction have won prizes in the West Virginia Writers annual contests. She is currently the managing editor of O-Dark-Thirty, the literary journal of the Veterans Writing Project. For all of us writers, publishing at least SOMETHING can be the difference in our lives that keep us writing. It’s what makes you feel like a writer, and feel justified when you tell others you are a writer. Today I would like to discuss the process of submitting short stories and poetry for publication. I am not going to go into the craft of short fiction or poetry, as there are so many great books and blogs out there on this subject, but simply discuss the advice I have received and lessons learned regarding publishing. One of my early workshop teachers told me a great idea – submit your stories in tiers. For example, tier one would be the big-dogs, the literary magazines that we don’t likely have a great chance of being published in, but what they heck. Why not try? Tier 1 examples: The New Yorker, The Atlantic, Tin House, Ganta, Ploughshares, The Paris Review. etc. Tier two publications would still be pretty tough to get into, but maybe less impossible. What I mean here, is I’ve known people to get into them, but no one I know has ever been published in a Tier one publication, that I know of. Tier three, even more so. Tier 2 Examples:The Gettysburg Review, Zuotrope, Kenyan Reivwe, Missiouri Review, Iowa Review, etc. Tier 3 Examples: Indiana Review, Mississippi Review, Virginia Quarterly, The Colorado Review, etc. However, I want to get into the reality of publishing now. Until you are awesome (I’m still working on that), getting into any of these publications will be tough. If you have done so, that is terrific. Congrats! But what do we do when we really just want to be published, and the big named publications aren’t giving us the time of day? Two great places to look for publications, and to narrow your search by genre, word count, and other categories, are Duotrope (which now costs money, unfortunately) and Poets & Writers (which is still free, I believe). This is great for those writers out there writing fantasy or scifi, or other niche categories, such as military, nature, etc. Even if you are writing literary fiction, you can find a great deal of publications through these resources. As I mentioned above, you may be targeting a niche. That is how my first story was published. I was a Marine for five years and wrote a short story that was inspired by that time and had a military angle going for it, so when I heard of the veteran focused publication “O-Dark-Thirty,” I was sold. You can find it at here, and more information on it and The Veterans Writing Project. I also published my first poem in a niche collection, this time focused on nature. If you have a niche you can target, go for it. I promise, it isn’t cheating. Another great source is writers conferences, where you get to actually meet the editors of these publications. It’s great to chat with these folks and see what they’re looking for, and when you submit you may get some feedback, which always helps! Just to warn you thought, some of these conferences can be very overwhelming. Don’t be ashamed of brining a good book and hiding out in Starbucks for a break from the crowds. Some I have enjoyed include the San Francisco Writers Conference, LitQuake, AWP, and Conversations and Connections. The Writer’s Digest offers a great resource for getting published, the Writer’s Market. In addition to listing sources of publication, this tomb offers advice for getting published, samples of query letters and all sorts of other helpful advice. The Writer’s Digest also offers advice for screenwriting, novels, etc., and I highly recommend it. Finally, I would like to discuss Craigslist and other such avenues. Maybe you have a story that you love and for some reason it isn’t getting published, but you’re sure it is complete and you love it. You could always pop on Craigslist and find an up-and-coming publication that may love your story. Are they a big deal? Probably not, but who cares. They may become something someday, it may just be that your story helps them shine, or it may just go on their website and no one reads it except the people who follow the link from your tweet. I say go for it, but only if you’ve tried the other avenues first. A lot of these publications are started by college kids, maybe MFAs, and they mean to go somewhere someday. If your story touches them, you may have just made a connection, and who knows where that can go. So in conclusion, my advice is to work through the tiers, search the sites and network at writers conferences, and if you just want it out there, give Craigslist or something like it a try. Whatever it takes to get you to keep writing and feel happy with yourself as a writer. Let me know when you have some success, and I hope this helps. Trauma Central: J.P.'s "journey out of shame, pain, and parental narcissism"